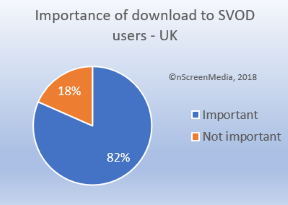 4 in 5 UK and US SVOD users say the ability to download videos from their favorite service is important to them. Why so many? Last-mile issues continue to plague the SVOD services upon which they rely. 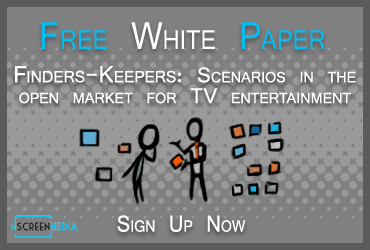 The new free white paper from nScreenMedia and sponsored by Penthera, When Streaming Fails: Last-mile Problems and What to Do About Them, makes it clear that download functionality is very important to consumers. 82% of SVOD users in the UK and 79% of US said that downloading video from their favorite service was important to them. What’s more 58% of UK and 55% of US users said the functionality was very important to them. Surprisingly, half of UK SVOD streamers take advantage of download at least monthly. The high interest in video downloads recognizes that problems with last-mile delivery still make video streaming difficult or impossible in many situations. Over half of consumers now consider the internet a natural part of their TV habit. They expect streaming video service providers (VSPs) to deliver wherever and whenever they want to watch. Unfortunately, VSPs can’t promise to do that because of problems with last-mile delivery. There are many ways last-mile delivery falls short. Though consumers expect continuous connectivity there are many situations where wireless, WiFi, and broadband are unavailable or provide only marginal coverage. As well, quality problems, particularly on mobile data networks, plague video streaming even when last-mile coverage appears to be strong. Even broadband struggles to deliver enough consistent bandwidth to stream an ultra HD movie reliably. 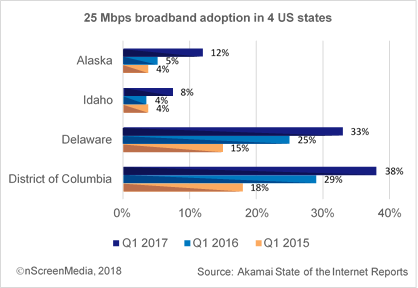 For example, only 8% of Idaho broadband connections can deliver 25 Mbps or more, the speed required to stream an ultra HD movie. Signs are that the problems with last-mile delivery aren’t likely to improve anytime soon. The white paper looks at three potential solutions in the works: 5G, WiFi hotspots, and fast broadband. 5G, which is beginning to roll out in the US later this year, could take 5-10 years before it achieves the penetration and coverage 4G provides today. Even then there will still be plenty of situations and locations where it won’t be available, as is the case with 4G. It is a similar situation with WiFi hotspots and ultra-fast broadband technology like fiber. The painful truth for VSPs is that when streaming fails they often end up shouldering the blame. So, they simply can’t wait around for new technologies to deliver partial fixes for the problem. They must act now. The paper looks at several approaches VSPs can take now to improve performance over the last-mile or avoid the situation completely. Specific solutions discussed include video downloads, pre-emptive caching, encoder upgrades, and user quality controls. The paper also presents new original research showing how consumers view downloads as an effective solution to last-mile issues. The white paper provides more detail on the problems with last mile delivery. It also discusses why network solutions are years away, and what VSPs can do to improve the situation immediately. 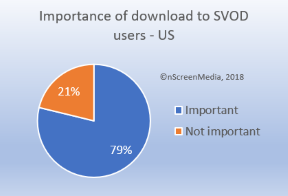 As well, it provides more data on how extensively download is already being used by SVOD users today in the US and UK. Download the free white paper When Streaming Fails: Last-mile Problems and What to Do About Them. 80% of SVOD users say that video download features are important to them. The high interest recognizes that problems with last-mile delivery still make video streaming difficult or impossible in many situations. With no network fix on the horizon, SVOD provides need to act now to deal with the realities of last-mile delivery.